Experts Mark Stacey and Charlie Ross gather a choice selection of antiques to flog in Harlow, including a stunning Japanese pot. 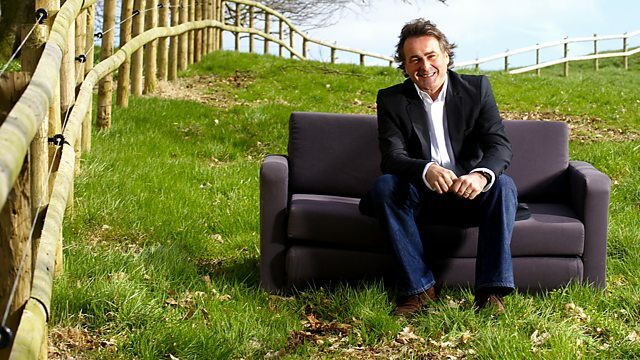 Today Flog It is in Harlow, a town made to house some of the post-war population moving from London. Harlow's design was the vision of chief architect and town planner Sir Frederick Gibberd. In 1951 he was responsible for this building, The Lawn. That is so iconic because it is Britain's first-ever tower block. But this isn't where today's action is happening. It's here, across town at the Latton Bush Centre. We've got a massive turnout here with their antiques. Mark Stacey and Charlie Ross are raring to go, so let's get this huge crowd inside. -Thank you so much for waiting and bringing this lovely coffee set. We all know what it is, but before we examine it, give us the family history. -Well, we know it's been in our family since 1939. I would think it was a wedding present for our parents. They were difficult times and it's not a thing you would buy with war coming on. -You've always used it as a coffee set? -I think I drank tea out of these. -The cups would take tea, but it is a coffee set. This is known as the Bonjour set. This is definitely a coffee pot in the long oval pattern. The teapot is much shorter and circular. I would say it is a little bit earlier than 1939. So it was probably second-hand, which often happened generations ago. I would have thought it tends to date to mid-1930s. After that, the patterns went a little bit...less quality. Less dynamic. I'm not absolutely sure of the pattern. I'm calling it pomegranate. I think there will be quite a lot of interest, even though it's not very bright and bold. It's complete and, more importantly, perfect, which is the nice thing. I would keep it slightly on the conservative side so that we tempt people. -But I would have thought £500-£800. -And we'll put a reserve of 500. -I suspect it will make the high end on a good day. It's so nice to see a complete set in such good condition. -Thank you for being patient with us and I'll see you at the auction. Let's hope for a top price. -Right. Henry and Mark here, whose are the candlesticks? -So who's getting the money if we flog them? -Four of you? They'll need to make some money! -A friend left them to me. -And what do you know about them? -Do you know they're candlesticks? -Top of the class. Have they got a hallmark? I think it's a lion on it. The great thing about a bit of silver is you can tell who made it, where it was made and when. The lion you were talking about is the lion passant. The moment you see the lion, you know they're silver. Next to the lion is an anchor. It is an assay mark, so they were made in Birmingham. If they had a leopard's head, they were made in London. A crown was Sheffield, et cetera. Now the letter N on there tells you that they were made in 1912. So they're post-Victorian. Corinthian column candlesticks. Probably the most popular design. And they are dwarf candlesticks. Sometimes they make 10 or 11-inch ones. And these are sort of 7 inches. I quite like the squat format. -They would clean up beautifully. You haven't cleaned them? A lot of people don't clean silver. If you rub them too much, you rub through the silver. B) You'll destroy the decoration. C) Worst of all, you can clean off the hallmark. -You should be doing my job! Know what I think they're worth? 200-300! -It's not as if they're the rarest things in the world. But of all silver objects, candlesticks are the most popular. I think 200-300 is spot on. -We'll put a reserve of 175 on them. Happy with that? -Thank you for bringing them along. That's 50 quid each. Or will you get most of it? Chris and Jean, thank you so much for struggling in on this hot day with a great lump of furniture. I'm very proud of you. Give me a bit about your background. You're both involved with a charity. -To furnish their bedsits or flats? "but if not, please sell it." -And this isn't what people want? They want beds and wardrobes? Things we get a quick turnover with, to go in a house in Harlow. We don't get much call for these desks! -We need practical things for people. They need wardrobes, beds, sofas. We pick up good quality furniture. Well, carry on the good work. Let's hope this adds to the kitty. -Do you like it? Would you fancy buying it? -Not in my house, no! It wouldn't necessarily go. I can see its charm. As a writing desk, it is very usable. This would fit into a large Victorian house or a small cottage. -but in fact it's early 20th century. I'd put this around 1930s and it's Dutch. it's on lovely flattened ball feet, so typical of the Dutch craftsman. It's not machine-made, which is really nice. you can see the whole construction, even the drawer linings, it's all made of oak. and reversed to make a chevron. They didn't need to do that, but it's nice and adds value. Those little architectural details make it a little bit more expensive than it would normally be. Right. I expect you want to know roughly what it's worth. for a continental writing desk. But it's early 20th century. I think it's got a value of around £200-£300. I'd like to see it get to £300, but we need two people. That's all. -and a reserve at £100. -And hopefully two people will fight over this. -It's lovely to know about, to get the history. Martin, HMS Ganges Association? You must be a naval man. -I joined when I was 15. Very tough time. Very strict. -Is that where you found the pot? -When I came out of the navy, I lived in Chelsea. -And the lady above me said, "Could you clean my windows?" So I said, "Certainly I will." -She said, "I'll pay you." I said no. In 1966, just after the World Cup, she called me up and said, "I'm moving." -put it on the chest of drawers. -And you never dropped it. -It's been in the cupboard ever since! -So you don't actually like it? -No use for it at all. -I will now appear to be wildly knowledgeable about it! I've looked at the bottom! -and went on to become the Royal Doulton company. What I think is most interesting is the decoration of it. -A lot of Doulton Lambeth wares weren't glazed. -and yet it's Doulton. As if they were influenced by Wedgwood. Looking at the bottom, it's stamped 1881. -That is 130 years old. -Of moving it backwards and forwards. Not by you for 130 years! And all the rosettes, the glazing, is in perfect condition. -And it's got a value. -You could certainly double that. And add a bit more, hopefully. It's certainly £50-£100. -I would want to put a reserve of £50 on it. -That's fair enough. Absolutely, yeah. it might well trickle on to £100. Thank you very much for bringing it along. We've seen some cracking items, but can we flog them? This 1930s Clarice Cliff coffee set has languished in the sideboard. Could it be a hidden gem? They're small, but are these silver candlesticks beautiful enough to attract an admirer? Will the bidders turn out for this Dutch desk? It's all in the aid of charity. And can this gift for Martin's window-cleaning skills sparkle and shine today? All our lots will be going under the hammer here at Reeman Dansie Auctions in Colchester. The man on the rostrum is James Grinter. This pair of silver candlesticks should light up the saleroom. We're looking for £200-£300. They belong to Henry and Mark here. This could be your inheritance! -Dad's not passing them on? -And you don't want them. So, £200-£300. I love the Corinthian columns. Little mini columns. -Yes. They'll dress any dinner table. -You should have had a dinner party before the valuation day! -Take a bit of cleaning, though. -Have Flog It in for dinner. Lot 219 is a pair of George V silver candlesticks. A handsome pair of sticks here. Start me at 150? 150 to start me? 140? 140 is bid there. At 140. At 140. Do I hear 150? 150. 160. 170. 170 is bid down here now. At 170. 180? At £170, I'm going to sell them. All done now at 170. You've got £170. We had a reserve at 175, so he's used a little bit of discretion. -I'm sure he'll make the money up. We didn't light the room up! No. That's auctions for you. They've gone! Now it's the Clarice Cliff! It wouldn't be Flog It without Clarice. Fingers crossed we get top money today. Now, Mark, you said it was pomegranate at the valuation day. -Well, it looks like them. -I had a chat to James. He thinks it might be passion fruit. I'm happy for it to be whatever fruit makes the most money! OK! Well, we've got £500-£800 riding on this. Let's hope for Anthony's sake we get the top end. Now the 1930s Clarice Cliff passion fruit pattern coffee set. £400 to start me? 400 I have. At £400 now. 420. 420. -At 480 in the corner now. It's going to be sold. Are you all done? -We were just above the reserve. -That's how these things happen. -It is. We needed two more people to push that bid. -But I did say on the day that the pattern isn't the most exuberant. -Watch out for your patterns. -Watch out for your fruit! Martin saw some wonderful things window cleaning in Chelsea! One was the Doulton jardiniere! -What a spot that was! And you've brought your wife, Mary, for moral support. -Do you like the jardiniere? -We'll flog it anyway. We hope for £50-£100 put on by Charlie. I want to know more about this window cleaning! -I used to live in Flood Street. -She lived at the top of the road. -I never cleaned her windows. She wouldn't pay me my money! Number 100 now is the Doulton Lambeth jardiniere with applied frieze. Say for it 50? £50? 40? 40 I have. 40. At £40. Do I have 45? 45. At 45. 50. -Bang on the lower end. £50. That's OK, isn't it? -It's been in the wardrobe! -I've earned a bit of interest on it! Right. My turn to be the expert. Remember that lovely Dutch desk? It's a bit of quality. who help furnish houses for underprivileged people. -We're not here with Chris today, but we do have Jean. And? -Jacquie, the director of Rainbow Services. -Pleased to meet you. What a lovely charity. -It's a really good idea. Things we don't need can furnish people's houses. It's a cracking piece of furniture. -but hopefully, you never know, we'll get more than £200. -Here we go. This is it. Number 732 is a 1920s oak desk. -£100 to start me? 100? £100 I have. At £100. 160. At 160 on my right. All done now at 160? All done. That wasn't bad, was it? I got very worried for a second! We got stuck on £100. In auctions, you need two people on something to push the bid. -That's going to Rainbow Services. have a disagreement and, before you know it, it's pistols at dawn. It looks very dramatic in the movies, but did duels really happen like that? Let's find out. Duelling with flintlock pistols was at its height between 1780 and 1820.
but pistols became the weapon of choice because they gave older and younger gentlemen an equal chance. I've come to meet Geoff Walker, who has one of the best collections in the country. What a wonderful collection! This is just a small part of it. What got you interested in duelling pistols? I've always been fascinated by guns. Duelling pistols show the cutting edge of the gunmaker's craft. These are, you know, the work of gunmakers at their zenith. -There are some famous names represented here. -Are we looking at English guns? -I only collect English guns. English makers were the best in the world. -Would they have been made in pairs? -Nearly all. You've only got one shot. They're muzzle-loading. -And so two shots were better than one. Let's find out the differences between some of the guns here. This is a set of duelling pistols. These are very mean pistols - they've got no sights, no decoration. They would have been made for a particular customer. -So the gunsmith would have measured his hand. They should be an extension of your arm, so you could feel it come up... It would be very natural. -Pick one up and they've got a beautiful balance and weight to them. -What should I look for when I buy a duelling pistol? -You cannot get better than that name. Two brothers - John and Joseph. I prefer John, but a lot of people prefer Joseph. At least they didn't settle it in a duel! -There was lots of honour at stake back then? They vied with each other. There was no real advertisements about guns. They had to have a good reputation. A set of pistols, late 18th century, what would they cost then? -These are Manton, top of the range. -John Manton at his very best. And these pistols in 1790, I have the receipt, cost £23. -That's including the case and the flask. -A lot of money in 1790.
could you get a pair for £6,000 to £7,000? -Yes, certainly, that's about where you'd start. But if you want the top names and the top quality, you've got to go further than that. Anything from £5,000 to £100,000 for something very rare and very special. 'to defending a lady's honour. 'In the 18th century, honour was more valuable than life itself. In the movies, we see two gentlemen back to back, taking paces away from each other. -It's by arrangement between the parties. Minimum distance was ten paces. Those would be 30-inch paces. -8.5 yards would be a minimum distance. -That's quite close. You can't miss, can you? But very often they were fought at quite close quarters. 10, 12, 14 paces was quite common. They pace out, turn round and take aim. Do they fire straight away? Not necessarily. Quite often they would have to decide who should fire first. -I didn't know that. I thought it was the first person to get a sensible aim. -The quickest aim, quick draw? but more often than not, one gentleman would have to stand and receive fire before it was his turn. then they could fire at will. And gentlemen didn't cheat, or did they? Did they turn after five paces? That's what seconds were for. They were umpires, but it's quite tricky with two armed protagonists for a second to say, "Don't do that." And there are instances of seconds having to fire a gun to prevent any skulduggery. But generally, they were fought with the utmost bravery, chivalry and as gentlemen should. I absolutely love these guns. They're so tactile and extremely beautiful to look at. Even though they're lethal weapons, they are true antiques. Lovely things to own and enjoy the workmanship. -Geoff, thank you so much. Back to the valuation day in Harlow, there's, well, magic in the air. but give us a bit of the history first. I've had this for about 34 years. I used to do table-top magic shows and my aunt in Aberdeen bought it in an auction. -I think she paid £20 for it. -34 years ago, you must have been quite young. I was about 14 at the time. -It fell by the wayside when I was about 20. -Sarah, where has it been for the last 20 years? -You haven't magicked it out of the loft until today? Let's have a look at it. It's in a nice, leather fitted case. Oh, it's in nice condition, isn't it? Not a lot of damage at all. Normally, you get the odd bit of scuffing. where you fold them and you flick them and they open when you want to wear them, but this isn't like that. and then the Edinburgh retailer. Then we've got a nice mark, "Imperial Quality", as well. Back when these were popular, in the late Victorian, Edwardian period, heads were a lot smaller. Most of the time, they sit on the top of your head, but this is quite a good size. It's too big for me. I think it's quite a good size. -It's been in various lofts. Your aunt bought it for 20 quid. What is it worth today? We've sold them before on the show. They're not very rare items. It's nice that it's got the fitted box, but we must be realistic. I'm gonna say that auctioneer's cliche. I think it is probably worth £80 to £100. -And hopefully on the day, we'll get 100, maybe even 120. -So we'll put a reserve of £80 on it. Thanks for coming in. I look forward to meeting you both at the auction. -Let's hope we pull a magic price out of the hat on the day. I like this. This is typical of what we find at our valuation days. It's a watercolour, English, early 20th century, signed by the artist. It's a lovely maritime scene, a seascape. At auction, this will be worth around about £40 to £60 maximum. What I like about it is it's a bit of affordable fine art and I'm gonna put these people to the challenge. How many of you buy a print framed and stick it on the wall? -All of you. And you spend about £80 to £100 doing it possibly. -How many of you have a bit of fine art, signed by the artist, a watercolour or oil painting? Well, you can pick up a piece of art like this. It's a good investment, put it on the wall and enjoy it. It's got real integrity, heart and soul, and it's a one-off. I challenge you all to go out and buy some fine art. If you like it, that's an even better investment. -John, you've brought a complete history of a man's record in the army. -He was my grandfather on my mum's side. He was a rifleman in the Scottish Cameronians, in the First Battalion. -Weren't they smart in their kilts? -Did he get through the war? -Yeah, he died when I was about seven. He must have seen a huge amount. -He travelled a bit as well? What I really love is that he's written here, chronologically, everything he's done with the army. So he was in the beginning of the war. In 1939, he was in Calcutta, then he was in France. and finished the war in Egypt. how the war moved, and that guy saw it all. -Not many of them would have been able to do that. ..which he caught in flight. There's a wonderful page of recreation. And there's a game of polo going on here. Keeping fit - look at that for a bit of gymnastics! Extraordinary. but this, I think, is my favourite page. -There's a wonderful picture of Gandhi. He looks very thoughtful, a man of principles. -Now, why are you going to sell it? Your children aren't interested in this? If you're not keeping them and your children won't use them, what better than to put them into auction? -If somebody is gonna pay money for this, they are not gonna throw it away. -It's gonna be looked after. The medals are worth £30 to £50, £40 to £60. The album must be worth £100 of anybody's money, £150, I think. -So, 150 to 250, with a reserve of £150. Happy with that? Thank you very much for bringing it along. This is a real history lesson in one album. It certainly is. Thank you very much. -As soon as I saw you holding this, I thought, "I've got to film this." It's a wacky, bizarre item. Where on earth did you get it from? trying to avoid damage from the assorted kids and pets that we have. I'm just interested in finding out about it and if it's worth anything. A lot of people will be interested in it. I think it's Austrian. And late 19th century, so any time between 1880 and 1900. And she's made of pottery. These were produced in large numbers, normally figures. Or busts. I've never quite seen one so elegant as this. Have you always known it like this or has it had other pieces with it? But that, I believe, got broken. And it's been sitting on a wooden chair that my grandad made. -Originally, these would have been made in pairs. -I did wonder if it was staring at somebody else? There would've been a gentleman with her. It's just so ridiculously camp. You've got a wonderful plumed hat. The quality is very good. Lovely, delicate expressions on her face. And she's holding this wonderful, oversized fan. It's a fantastically outrageous item really. Chris, we come now to the crucial point of how much is she worth. If we were putting it into auction, we've got to bear in mind some minor damage, the odd chip here and there. But with something as complicated and as old as this, you have to expect that. I would suggest £300 to £400. Would you be happy with that? -And we'll put a reserve of 300 with 10% discretion on that. On the day, it might be a surprise and fly away. -Hopefully, not off the shelf until they've paid for it! -Thank you for bringing such a memorable item in. -Thank you very much for giving me the information. Can the auctioneer magic up some interest in this top hat, complete with fitted box? but can it win a place in someone's heart? And can this lady turn enough heads to win a suitor? The auctioneer James Grinter thinks she's got potential. I don't know what to say. Mass-produced Victoriana. Massive, great big pottery figure. This belongs to Chris. It was his grandfather's. And I think it's time to go. We've got £300 to £400 on her. -You get a lot for your money. -It's the largest figure I've ever seen. -In 27 years, I haven't seen another one like it. -It was one of a pair originally. -Where would you have displayed it? -Perhaps on top of a Victorian upright piano? -Or a purpose-made piece of furniture. A small chair or little settee made for the two of them to sit together. The condition is absolutely remarkable. It's perfect. It's High Victorian taste, but I think it will appeal to people. It's a very decorative thing. Not necessarily in fashion today, but I still think it'll do quite well. -I'm glad it's the lady. A single gentleman won't sell so well. -I've never seen one before, so it's difficult to gauge. -So we could get more. -Sarah, Michael, good to see you again. Can you do any magic tricks? into £100 right now in the next couple of minutes. -We've got a value of £80 to £100. It's in a nice leather box and top hat size is important. -A lot of them are very small. -They don't fit your head. This one does fit, so hopefully we'll be able to get £80 to £100. Before that, Michael has one last little magic trick. No.415 is the Edwardian, black, silk top hat by Scott. Original box. £60 to start me? 60 I have down here. At 60. Down here at £100. Are you all done? We did it. We got that magical £100. Well done. There's a bit of commission to pay, but it's a nice meal out. Lots of memories for you have gone. -Yes, but I've had a good time with it. -Has he still got the cape at home and the wand? This next lot is a cracking item. Not a lot of monetary value, but there's a lot of history here. -of your grandfather's campaign throughout the Second World War. -Have you got other things that he left you? -There are photographs that I'm definitely keeping. No.504 is a group of five Second World War medals. And the photograph album. £100 to start me? At £100. 110? At £100. -110 anywhere? At £100. Any advance? -Grandad's looking down, giving you a bit of a ticking off. -John, please hang on to them. Next, that wonderful Austrian pottery figure. She's big, blousy and beautiful. She's late Victorian and very rare. We talked to the auctioneer about it. We don't have the owner Chris. -But we do have his son Robert. Hello. Is Dad on holiday? -Yeah, but I don't really know where he is. -Which means it's party time! -Seriously, if we do really well on this, you will get on the phone to Dad and let him know. We're looking for £400-plus. James agreed with your valuation. It's lovely. It's very televisual. -And as you say, she's blousy, a lot there for £300 to £400. -I think this lot will agree with your valuation. We've got the nod of approval. No.63 is the very large, 19th century German ceramic figure of a lady. Very unusual. I have two commissions and I start the bidding at £280. 300 with Ian. At £300. 320. At 440. The lady's bid now at 440. -What have we missed, Mark? -I do believe they're gonna be extremely happy with that! They've got to be happy with that. I'm tingling all over! What do you think of her? You've seen her around the house. -I really don't like her. -But you like the £1,500. -I like the 1,500 quid! You should phone Dad. That'll make his holiday! -He'll probably stay away for another two weeks, so it's more partying! I thought 300 to 400 was a little on the conservative side, but it is best to tease the bidders in. -But 1,500, you can't beat it! -What a fine lady! She had a fine figure and she achieved a fine figure. We've had great fun here, so until the next time, there's plenty more surprises to come on Flog It! Experts Mark Stacey and Charlie Ross gather a choice selection of antiques to flog in Harlow, including a stunning Japanese pot. Presenter Paul Martin has a touch of James Bond about him.